Our World famous Route 66 motorcycle tour travels the original Route 66, known as the “Mainstreet of America” or “Mother Road”, is 2400 miles long from Chicago to Los Angeles, crosses three time zones and 8 States: Illinois, Missouri, Kansas, Oklahoma, Texas, New Mexico, Arizona and California. Route 66 has been the path of migrants, dreamers, desperadoes and an entire generation of vacationers discovering the way west. The 1950’s were the Route 66 glory days, when thousands of cars rode bumper to bumper behind each other to experience the Western frontier. Hotels, motels, gas stations, classic restaurants, and the “New” America sprang up everywhere. Much of Route 66’s classic roads, restaurants, gas stations, and nostalgic landmarks are preserved just as they were in the 1950’s. The famous and nostalgic Route 66 is the road created in heaven for motorcycle touring. Simply stated, this is the guided tour of America! Welcome to the Windy City! Nicknamed the ‘Paris of the Prairie’, Chicago is the biggest and most exciting of the Great Lake cities. It includes a stunning skyline along Lake Michigan, and a gamut of top-rated museums, restaurants and cafes, and innumerable bars and nightclubs that pay homage to the city’s strong jazz and blues heritage. Tonight you will get to meet your fellow riders and Tour Guides at an Orientation Meeting at the tour hotel, followed by a great Welcome Dinner and celebration downtown. Your dream Route 66 journey is about to begin! This morning you pick up your bike and are off to the ultimate American road trip. The legendary Route 66 begins at the doorstep of our EagleRider location, cutting through the state of Illinois before running all the way to the Pacific Coast. From Chicago you head south along the Pontiac Trail, the original name for this bit of the road here, passing through Joliet, checking out the Launching Pad Giant, stopping at the amazing RT 66 Museum in Pontiac and generally getting a feel for the rubber on the Mother Road. Try to get up early to walk across the street today and enjoy an early morning view of the St. Louis Arch and Mississippi River before we hit the road. We quickly leave the city in mirrors as we settle in to enjoy the rolling Missouri hills that make this area so beautiful and fun to ride in. We will stop and see the famous World’s Largest Rocking Chair in Fanning, wind our way on the twisting roads of Devil’s Elbow! We will stop to meet Gary’s daughter Barbara at Gay Parita’s a Route 66 icon. Tonight we will enjoy a stay in Joplin, a city that was hit very hard in 2011 by a massive tornado. We’ll hang with the locals in the small downtown area and hear some amazing stories about what it was like to be in the eye of a massive tornado! Today is all about the ride! From Joplin we head west through the rolling hills and horse country that is Oklahoma, passing through the towns of Miami, Claremore and Catoosa, where the legendary Blue Whale resides, and stopping for lunch in a Tulsa diner. We will also pass through the lands of several Native American tribes. In the 1830’s all this land, held to be useless by the Federal Government, was set aside as Indian Territory–a convenient dumping ground for the tribes that “blocked” white settlement in the southern states. The Choctaw, Chickasaw, Seminole, Creek and Cherokee are some of the tribes that make up the state’s large Native American Indian population. Further west you ride through El Reno – over the mile-long bridge, near Bridgeport and into Oklahoma City, the heart and soul of Route 66 country. This morning we travel along some of the oldest stretches of Oklahoma’s Route 66. Once the land of vast buffalo herds, this section of 66 traverses some of the great cattle trails which were used in the 1860s to drive herds of cattle from Texas up to the railhead in Abilene, Kansas. We will ride along a section of the Chisholm Trial, which passes through Yukon and El Reno, and stop at the amazing Route 66 Museum in Clinton. 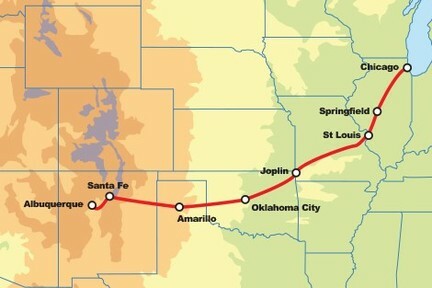 After lunch we cross the border into the Texas Panhandle, the southernmost portion of the Great Plains. Our good friends from “The Big Texan Steakhouse” will pick our group up at the hotel in a fleet of old Caddies graced with the horns of Texas Longhorns across the hood and take us to enjoy the absolute best steaks in Texas! Today you leave Texas and are on your way into “The Land of Enchantment”, New Mexico – after passing through the world famous Cadillac Ranch. How about the ghost town of Glen Rio, where you can stand with one foot in New Mexico and the other one in Texas? From there we enter the land the Comanche Indians, where mesas, mountains, cactus and pines define the landscape as head up into the High Plains and altitude of Santa Fe in central New Mexico. Santa Fe is one of America’s oldest and most beautiful cities!